For komiks fans in the Katipunan area, there’s an event taking place at the U.P. College of Arts and Letters today and tomorrow, featuring work and appearances from many familiar faces, including artists from the Sulyap anthology. It’s sponsored by U.P. Grail, a comics organization in U.P. Two of Metro Manila’s finest comic book establishments will be celebrating anniversaries this week. First up is Planet X Comic Shop over at Glorietta, which will be having an anniversary sale from September 27 to September 30. Next is ComicXHub which will be having an anniversary party on September 29, Saturday, complete with raffles and special guests. If you’re a comics fan, and have got the time, be sure to check out these events and help support local comic book stores. Remember that fundraising event for Philippine representatives to the Global Graphic Novel Conference at Oxford, England? Well, our reps are back from the conference, and Karl de Mesa has an article on Rappler covering their journey, with profiles and excerpts from their papers. Go check it out! MYTHSPACE. A Philippine Mythological Space Opera. Mythspace: Liftoff Issue #0 will be available at the Rocket Kapre booth at the 2012 Komikon, on October 27 at the Bayanihan Center, Pasig. This is my first comic since High Society, and I’m very excited about it. More information coming soon! See you guys this Saturday at TEAM MANILA (1st level of the New Wing of Market! Market!) September 15, 2 pm. 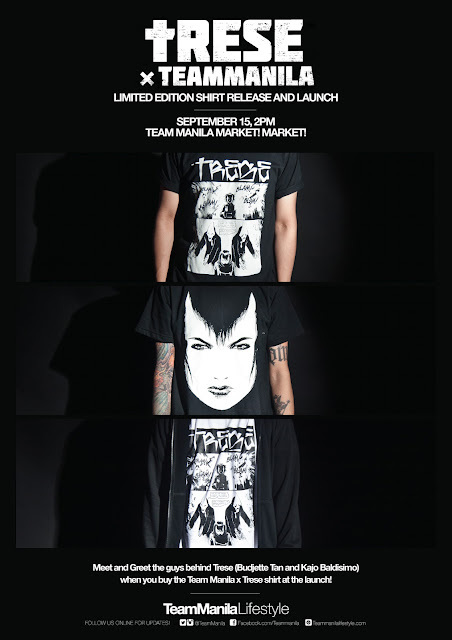 Me and Kajo will be there to sign your books (yes, copies of Trese will be available at Team Manila stores) and we’ll even sign your Team Manila x Trese shirts.